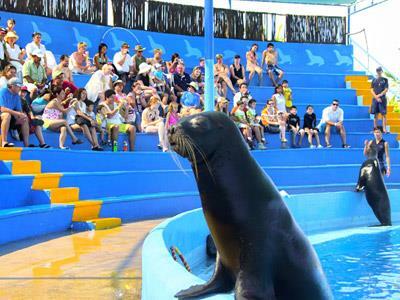 Spend the day with friendly sea lions on this fun-filled Sea Lion Discovery Tour at Dolphin Discovery in Puerto Vallarta. This family-friendly tour offers the unique opportunity to swim with sea lions along the Pacific Coast of Mexico. You'll watch them perform amusing tricks, incredible jumps out of the water and even share a finshake and a kiss. You'll also learn more about these fascinating marine animals and how they live in the wild. It's an incredible adventure for the entire family. Book you spot and get ready for an unforgettable experience on this exciting tour in Puerto Vallarta!